For GMs in need of civilization! When you need a fully-detailed settlement right now, The Emergency Settlement Collection comes to your rescue. Ranging from tiny villages to massive metropolises, each of these six ready-to-play settlements comes with a straightforward overview, history, notable locations, interesting characters, settlement statistics, new rules for PCs in or from the settlement, and secrets for the PCs to explore. Each settlement can serve as a jumping-off point for adventure, or a home base for an entire campaign. Maps of each settlement (tagged for GMs and untagged for PCs) are also included. 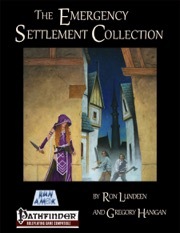 The Emergency Settlement Collection contains a city of art and song beset by dangerous foliage, an industrial metropolis bound to nefarious patrons, a gnome boom town amid a firearms revolution, a reclusive village of nature-warping lizardfolk, a plane-hopping city of vicious cannibals, and a sleepy frontier village near a pit of danger and adventure. The Emergency Settlement Collection is written by Ron Lundeen and Gregory Hanigan, with art by Stacy Drum, Sydney Lehmann-Secor, Marco Morte, Jeff Strand, Blake Wilkie, and Maciej Zagorski (The Forge Studios), with cartography by Tommi Salama, Marco Morte, and Hugo Solis.